HomeNBAJazz are 25-10 in the second half of the NBA season; is this team as good as last year’s? The Jazz are now 25-10 in their last 35 games. That’s not quite as scintillating as last season’s 29-6 run to finish the season, but it’s not too far away. But when you ask this Jazz team, players and coaches about whether or not they feel this season compares to last year’s, they cringe at the question. Whether it’s the NBA experience many of them have, or because of an early-season stretch where the team felt they had earned a bit more than they had and played with some complacency, the Jazz are very reluctant to discuss the similarities. Instead, that’s been replaced with a mantra that’s echoed so often in media sessions that you might think there’s a record scratch somewhere: The Jazz want to get better in every game. Get better at what, coach? For some guys, Snyder says it’s their health. Raul Neto and Ricky Rubio both have dealt with soft tissue injuries over the course of the season, and will need to make sure that they’re in peak condition going into the playoffs. It has appeared that Snyder has kept Neto and Rubio limited to about eight-minute stints of play in recent games, though it’s not clear how much of that has been about injury prevention vs. a normal rotation. For others, there are still aspects of their individual skill development that can improve. Snyder started a list. “Rudy [Gobert] has been working on the foul line, he knows what importance that has for our team. Donovan [Mitchell’s] been playing great offensively, and him being more consistent on the defensive end is something [assistant coach Johnnie Bryant] has been giving him a hard time for a while, that’s something he can take pride in. Joe Ingles and his leadership on the floor,” he said. It’s true, Gobert’s somewhat in a slump at the free-throw line. Kyle Korver is another player who has been upset with his shooting form recently, and hopes to fix it and get it in tip-top shape in these next nine games. The defense has been somewhat inconsistent. There are games like Saturday’s, in which the Jazz held the Bulls to just an 84 offensive rating and only two 3-point shots all game long. But there are still some games, even just some stretches, in which the Jazz don’t provide enough urgency on that end of the floor. Look at Thursday’s loss to Atlanta, where the Jazz allowed 19 made 3-pointers to the Hawks. 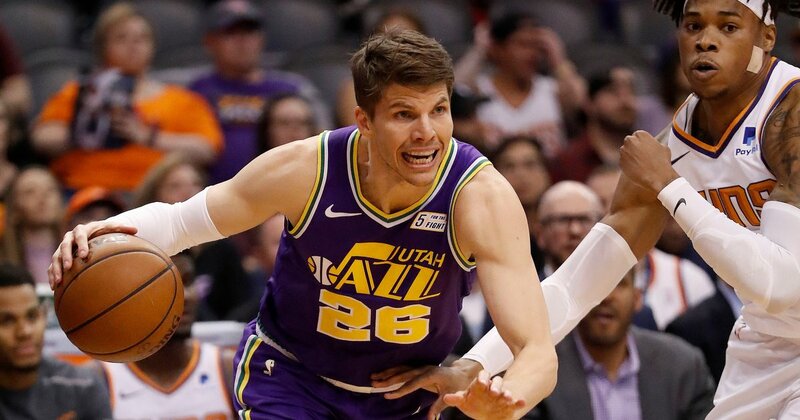 In that game, the Jazz seemed to have things under control, until a quick Atlanta run fueled by only two lapses turned things around in a hurry. Even in the Chicago game, a 12-4 run to pull the Jazz’s lead to a still-dominant 28-points forced a Snyder timeout, and a conversation. “I think we can improve on little areas,” Mitchell said. “We can’t continue to let teams come back.” He cited the Jazz’s loss to New Orleans, when the team let a 17-point lead slip through its fingers, as another example. So no, 25-10 isn’t good enough, and neither was 29-6 last year, for that matter. Tipoff • Monday, 7 p.m.